Published on 16. 09. 2012 in comics and cartooning, hype & linkage, journal and music. Closed Tags: Chris Ware, Christopher Nolan, Dave Sim, EC Comics, Ed Piskor, El-P, Fantagraphics, Hooded Utilitarian, Kanye West, Nas, Ng Suat Tong, PTA, Rosh Hashannah, Slavoj Žižek, Steven Grant, The Dark Knight Rises, Tom Spurgeon. Not much to report from this angle this week, apart from the fact that the Jewish new year reminds me that I’ve been back in the ole home country for over a year now. Last year’s Rosh Hashannah kind of marked a fresh return to new beginnings here and it’s been a great ride since then, one of the best years I’ve had. Thanks to everybody taking part. 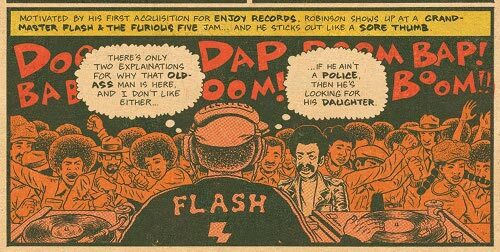 I would like to supplement this week’s welcome announcement that Fantagraphics is going to publish Ed Piskor’s online comic The Hip Hop Family Tree with this interview with Piskor, conducted by my man PTA on said piece of edutainment. Also in comics, the Hooded Utilitarian’s five-year Anniversary of Hate! has brought some good criticism to the table. I liked in particular Steven Grant’s essay on bad comics and why the field still makes sense as a vocation. Plus! HU has reprinted Ng Suat Tong’s notorious Comics Journal essay from 2003 on why the EC New Trend comics are among the most overrated in the canon, supplemented by a back-and-forth on the issue with R. Fiore. Other (more!) comics-related links: Slavoj Žižek on The Dark Knight Rises, Tom Spurgeon on Dave Sim’s recent, depressing letter of resignation, Chris Ware on display in New York. Meanwhile in hip hop, I really enjoyed what El-P had to say about Nas’ classic debut album Illmatic (1993) in this otherwise rather dumb list of best albums of the nineties, and I totally dug this video of a young Kanye West rapping with his mom.